Photo Caption (Image 1- From L to R) : Mr Rajesh Menon, Deputy Director General, Confederation of Indian Industry; Mr Sanjay Jayavarthanavelu, Deputy Chairman , CII Southern Region ; Mr M Damodaran, Chairman, InterGlobe Aviation Ltd; Mr Rakesh Bharti Mittal,President, Confederation of Indian Industry; Dr Krishnamurthy Subramanian, Chief Economic Adviser, Government of India Mr Vikram Kirloskar Vice President, Confederation of Indian Industry ; Mr R Dinesh, Chairman,CII Southern Region and Mr Sathish Raman, Regional Director, CII Southern Region at the CII SR Annual Regional Meeting & Summit on Industry Future Forward held today in Chennai. Chennai: The country's Inflation is well under control at 4.5 per cent from the earlier 10 per cent and there is a high level of growth across all verticals since liberalisation, said Dr Krishnamurthy Subramanian, Chief Economic Adviser, Government of India. In his keynote address at CII Southern Region Annual Regional Meeting and Summit on ‘Industry Future Forward - India @75 : Building an Inclusive Agenda in the Disruptive Growth Era’ organised by the Confederation of Indian Industry (CII) here on Friday, he said that the growth had been achieved amid global economic challenges and India had made it a point to hold its head high in the comity of nations. The noted economist also said that domestic consumption had got a boost because of the low inflation backed by a strong monetary policy framework with lots of path-breaking reforms. Stating that the GST had acted as a game changer for India to become a single market, he said that the time had come for taking disruptive ideas of all kinds in the right sense, as all of them were aimed at the overall development of the country. Dwelling at length on the aspect of culture of credit vis a vis the bankruptcy code, Subramanian said that the doctrine of pious obligation always emphasised the need to clear the debt as one of highest moral duty of the borrower. M Damodaran, Chairman, InterGlobe Aviation Ltd, said that the country needed disruptive challenges to prosper and wanted the CII to set the pace on that count. He wanted the youth of the country to be impatient in terms of achieving progress at all levels with a certain amount of responsibility. In an age of disruption, the country should have the ability to know its own strength and at the same level the enemy's weakness in drawing the battlelines, he remarked. He called upon industrialists to create opportunities for the less privileged backed by several disruptive ideas as a matter of participatory thing, all for achieving human progress. 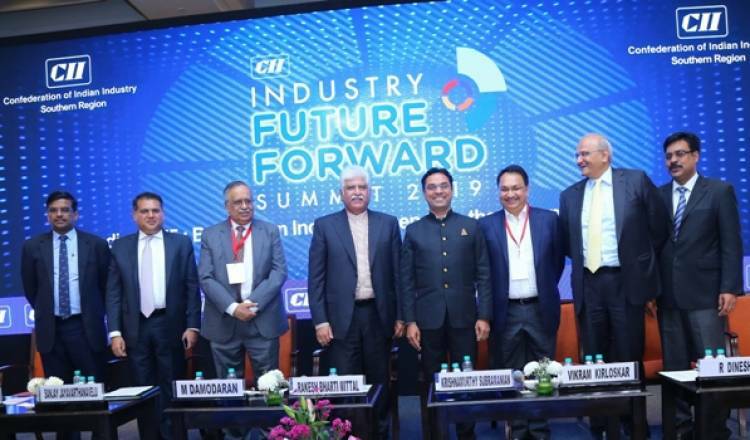 Rakesh Bharti Mittal, President, CII, emphasised on engaging the youth on various employments by launching vocational training centres at the school level itself. He touched upon the aspects of leasing out farm lands to the private sector for bringing in greater agriculture production as also food processing as a viable proposition. He said that India has the potential to become one of the top three nations in the world with the use of its youth power productively. Vikram Kirloskar, Vice President, CII, stressed on the need to be highly competitive to stay ahead of the growth curve with a pointed reference to the use of its nature and spirit in the aviation sector. He also wanted to follow the principles like quality maintenance and prompt delivery with an eye on safety of everyone around drawing examples from his experience at a global car major. Earlier, R Dinesh, Chairman, CII Southern Region, spoke on the general economic climate in the country and how public policies could help influence the future of governance and industrial progress based on innovative and disruptive technologies. Sanjay Jayavarthanavelu, Deputy Chairman, CII, Southern Region, said that the CII as an industrial body always helped the nation in achieving its economic growth with a sense of inclusivisity.